This is a compact one–story home that is quite inexpensive to build, thanks to its perfectly rectangular shape and simple roofline. At just 1,260 sf, it manages to provide three bedrooms and two full baths, and cathedral ceilings in the living room and master bedroom make these rooms look and feel more spacious. The front door opens to the living room, which has views to the front and the side. It is open to a dining room with windows that look out to and through the front porch. A pass–through opening to the kitchen sits above the sink for easy clearing. A hallway down the center of the house leads past a coat closet and the opening to the kitchen on the left and a laundry closet on the right before bringing you to the three bedrooms. Two of the bedrooms share a full bath, while the master bedroom of course has its own bath. A small deck at the rear of the house is accessed from the master bedroom. City Bungalow 2 is a slightly smaller version of the original, with some small differences. 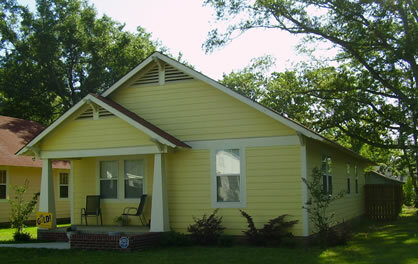 This three–bedroom home has simple craftsman details, with tapered columns, wood brackets and exposed rafter tails. The inviting front porch has tapered wood columns atop brick pedestals, and has room for outdoor furniture to enjoy the weather.